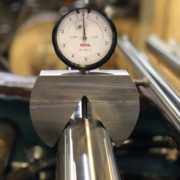 When measuring how smooth a turned, ground & polished (TGP), chrome plated hydraulic cylinder rod, or any other cold finished bar, the primary reading or parameter used is Ra surface finish. There are many other parameters to measure surface finish by, a number well over 100. But today we will focus on this most common in the cold finished steel bar industry, Ra surface finish. In a nutshell, surface finish is how smooth or rough the surface of the bar or other medium is. The smoother the finish, the lower the Ra number will be. If you look closely at the surface of the steel bar through a microscope, the actual geometry of the surface will be irregular. It will have peaks and valleys of varying heights and depths. Looking at the example wavelength below, you can see the many peaks and valleys of the bar surface over the 4mm (0.1575″) test sample length. The resultant Ra surface finish of this part is 0.164 µm (micrometers), or 6 µin (microinches). A 6 Ra (µin) is a very smooth polished surface. 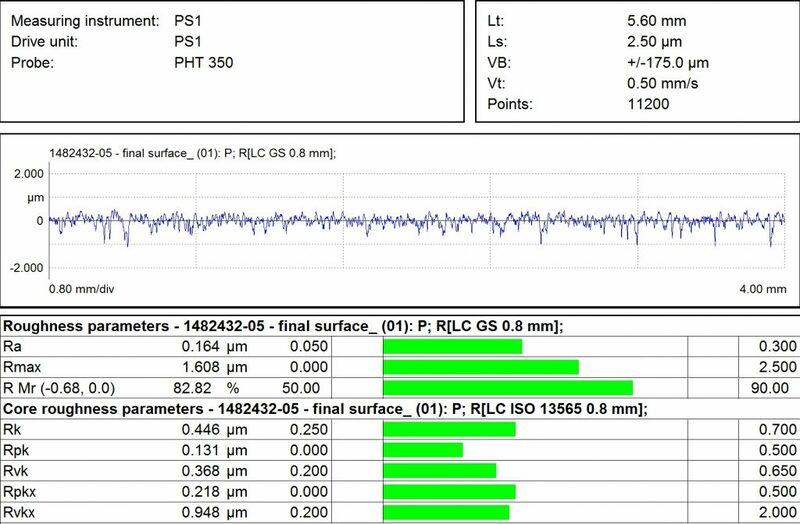 Actual surface profile showing the Ra surface finish of 0.164 µm (6 µin microinch) on a ground & polished steel bar. The photo of the ground & polished steel bars show what the surface finish looks like when visually looking at the surface. It looks nearly like a mirror finish, smooth to the touch if you trace your hand along the bar. When you look at the surface geometry with a measuring device or microscope, there are actually many peaks & valleys which are too small for the human eye to see. What is Ra Surface Finish? 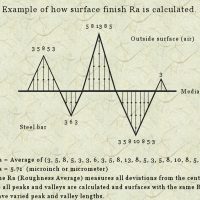 Ra stands for Roughness Average. In past years Ra was also known as Center Line Average (CLA), or Arithmetic Average (AA), but today Ra is the most commonly used surface finish parameter in the steel industry. 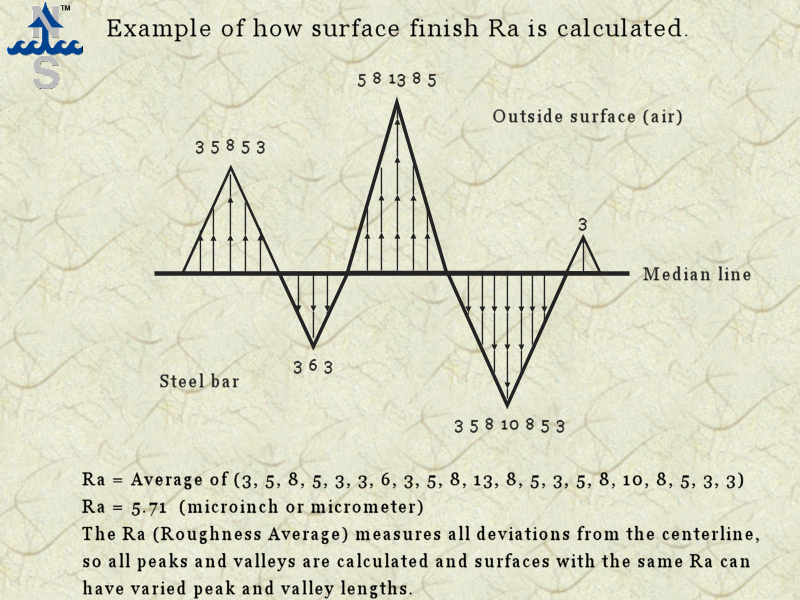 What Ra measures is the average distance (or height) of the peaks & valleys from the mean line. Most drawings and prints you see will have a Ra surface finish requirement called out on it. A device called a profilometer can quickly and easily measure the surface finish of a steel bar. In the example below, we see a drawing of a sample surface profile. This sample profile has peaks & valleys, along with a number value indicating their distance from the mean line at given points along the bar sample area. The numbers can be microinches or micrometers. Example of how Ra surface finish is calculated. The heights of the peaks & valleys are averaged. 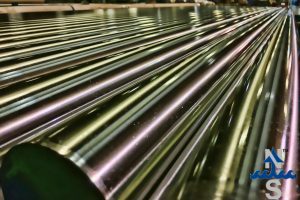 Surface finish and Ra are important to steel bars, shafts, and chrome plated hydraulic cylinder rods. 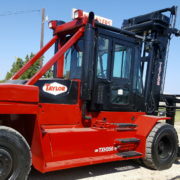 It will influence qualities such as the lubrication, ability to hold pressure, friction, resistance to corrosion, noise reduction, and visual appeal to name a few. Keeping the peaks to a minimum is helpful to reduce wear on a bearing or seal. Allowing the presence of valleys will help the same part retain oil or lubricant, also increasing the life of the bearing or seal. 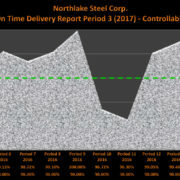 Rougher surfaces are more likely to collect and absorb moisture or water between the peaks and valleys, which can hasten corrosion and rust forming on the steel bar surface. Smoother & finer surfaces will resist this corroding process better. We employ the latest in polishing and super polishing techniques to supply you with any surface finish needed. Whether you’re looking for a specific Ra finish, or if you need a super polish with multiple parameters like Rmr, Rk, Rpk, Rvk, Rz, Rmax, or any of the 100+ options. 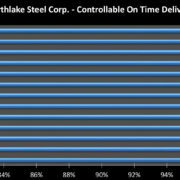 Northlake will work with you and provide the steel bars to all of your required specifications. We also have the ability to provide detailed inspection forms showing results of measurements all along the bar, and on multiple planes around the bar. With the ability to grind & polish to 16″ diameter and 75′ long, we look forward to meeting your challenge! Contact us online or call 888-278-4682 for more information.